Gregory C. “Ray J” Johnson, who piloted the space shuttle and more than 50 different aircraft, has retired after 28 years of service to the agency. Johnson came to NASA in 1990 as a research and instructor pilot in the Aircraft Operations division at NASA’s Johnson Space Center. He was selected as an astronaut in 1998 and piloted space shuttle Atlantis on the STS-125 mission to service the Hubble Space Telescope in 2009. Most recently he had served as the chief of the Aircraft Operations division and deputy chief of the Flight Operations Directorate. Johnson is a retired U.S. Navy Captain from Seattle, Wash.. He earned a bachelor’s degree in Aeronautics and Astronautics from the University of Washington, and graduated from the U.S. Air Force Test Pilot School at Edwards Air Force Base in California. 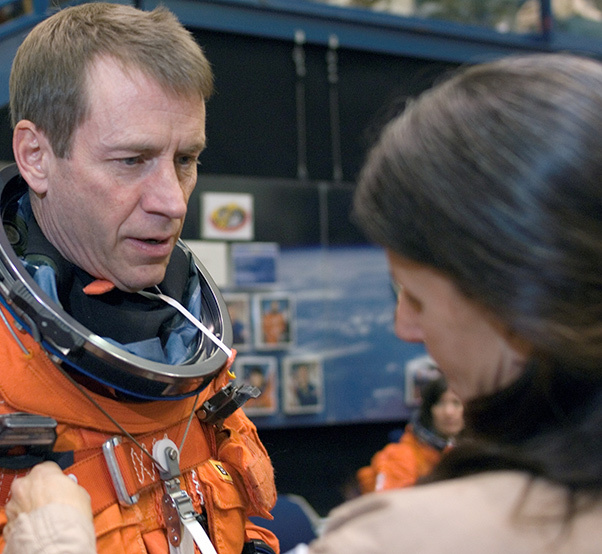 During the STS-125 mission, Johnson and his crewmates spent 12 days, 21 hours and 37 minutes in space, making repairs on the Hubble Space Telescope. They orbited the Earth 197 times, traveling more than 5 million miles. In addition to piloting Atlantis in space, during his time at NASA, Johnson also piloted the T-38 jets used to train astronauts, the WB-57 high altitude research plane, the KC-97 Super Guppy and the KC-135 zero-gravity plane, among others. He was the fifth chief of the Aircraft Operations division chief in the group’s more than 55 years of operation, before being named deputy chief of the Flight Operations directorate. Between his time in the Navy and at NASA, Johnson has logged more than 11,800 hours in more than 50 aircraft.